It looks like Microsoft is automatically downloading the Windows 10 April 2018 Update on PCs, even if users have blocked Windows from downloading updates until later in the year. Owners of Windows 10 Pro, who have selected the Semi-annual channel to determine the frequency of updates, have done so to ensure that when a major update for Windows 10 does get released, it isn’t installed right away. Instead, the update is delayed – or blocked – for a number of months until all the issues and bugs have been ironed out. 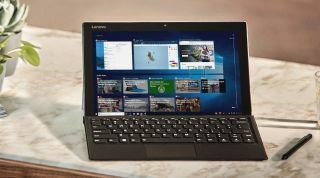 This is the preferred update cadence for business users (in fact, the Semi-annual channel used to be called ‘Current Branch for Business’), as it’s critical that their PCs aren't affected by any bugs that might emerge after a major update is released. With many users reporting of numerous problems with the Windows 10 April 2018 Update, it’s frustrating to see that Microsoft is continuing to push the update so aggressively, especially to users who have specifically opted out of this. Windows tip site AskWoody has reported on several credible reports about Windows 10 1803 (the other name for the April 2018 Update) being offered to people on the Semi-annual channel. With the update having recently released at the end of April, this should not be happening. It is not the first time Microsoft has been a bit too eager to install a Windows 10 update on people’s PCs against their wishes, as in November 2017 it forced the Windows 10 Fall Creators Update (1709) onto people soon after it had launched, even though they had opted out of it. Even in January 2018, Microsoft was apparently pushing that update onto people, even if they had paused updates for 365 days. While we can understand why Microsoft would be so keen to get everyone on the latest version of Windows 10 as soon as possible to ensure everyone has the new features and improved security fixes, ignoring people’s update preferences is a heavy-handed way of going about things. After all, there are many legitimate reasons why you’d want to hold off downloading an update so soon after it has been released, especially if you’re an enterprise user whose business depends on its PCs working without any issues. We’ve contacted Microsoft to find out more about these forced updates.